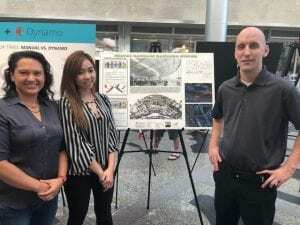 BIM Day is an annual event hosted by the Denver International Airport and was held at the Webb Municipal Building in Denver. This year’s theme was automation. PK Electrical attended the event and we were excited to showcase our work on the baggage handling system for the Seattle-Tacoma International Airport (SEATAC). 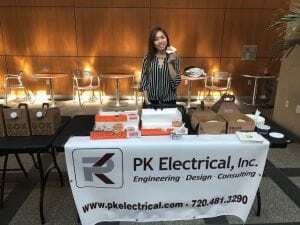 This year PK Electrical and Iron Horse were sponsors for BIM Day. We provided bagels and donuts for breakfast and Iron Horse provided a nacho bar for lunch. Why go to BIM Day? BIM Day is important for PK Electrical; it gives our production department an opportunity to showcase the hard work they have put into a project. This day also allows our production department to work together towards a common goal that they are proud of and want to share with others. This day can be beneficial to everyone else that works with BIM as well. It brings companies together for the same purpose and allows members of various production teams to see how others are utilizing BIM for their projects. This can allow for the implementation of new practices amongst various companies and disciplines. The interactions that happen during BIM Day can facilitate new or strengthened connections. BIM Day allows people to meet face-to-face with the people that they typically coordinate with over the phone. In order to prepare for the event, we contacted BNP, the primary consultant on SEATAC project, to see if we could use their photos for the poster. The poster was planned once we received approval to use BNP’s photos. Mike Bellender and Phung Ung were leads on the poster creation; they gathered pictures and wrote the corresponding text. The poster project took him two days to complete. Brenda Glavin, Production and BIM Manager, Michael Bellender, Senior Drafter, and Phung Ung, Drafter, all attended the event. This project demonstrates some of the intricate work that our production team puts out. 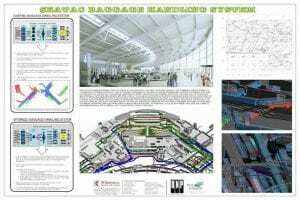 The SEATAC Baggage Handling System had a lot of conduit design which takes a long time to model properly. PK Electrical was hired for the electrical engineering and low voltage design services for the construction of this project. The project cost is estimated at $320 million. PK Electrical, Inc. is an electrical engineering firm located in Reno, NV, and Denver, CO. For more information about Reno and Denver electrical engineering offices, or if you are interested in learning more about PK Electrical and their contributions to other projects, check out our website.